The Secretariat of the United Nations Educational Scientific and Cultural Organization (UNESCO) and the World Heritage Centre do not represent or endorse the accuracy or reliability of any advice, opinion, statement or other information or documentation provided by the States Parties to the World Heritage Convention to the Secretariat of UNESCO or to the World Heritage Centre. 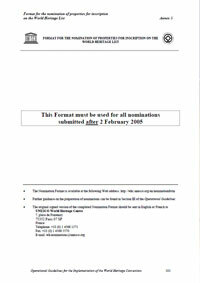 The publication of any such advice, opinion, statement or other information documentation on the World Heritage Centre’s website and/or on working documents also does not imply the expression of any opinion whatsoever on the part of the Secretariat of UNESCO or of the World Heritage Centre concerning the legal status of any country, territory, city or area or of its boundaries. States Parties are encouraged to submit their Tentative Lists, properties which they consider to be cultural and/or natural heritage of outstanding universal value and therefore suitable for inscription on the World Heritage List. States Parties should submit Tentative Lists, which should not be considered exhaustive, to the World Heritage Centre, at least one year prior to the submission of any nomination. States Parties are encouraged to re-examine and re-submit their Tentative List at least every ten years. States Parties are requested to submit their Tentative Lists using a Tentative List Submission Format, in English or French, containing the name of the properties, their geographical location, a brief description of the properties, and justification of their outstanding universal value. Nominations to the World Heritage List will not be considered unless the nominated property has already been included on the State Party's Tentative List. In conformity with Committee Decision 7 EXT.COM 4A, once inscribed on the World Heritage List, properties are removed from the Tentative Lists of States Parties. Requests the World Heritage Centre to present a proposal for revising the procedure of registration of Tentative Lists in the Operational Guidelines, for examination by the World Heritage Committee at its 39th session, in 2015. 3. Takes note of the Tentative Lists presented in Annexes 2 and 3 of this document. 5. Further requests the Chairperson of the 33rd session to establish a working group to continue the analysis of these issues in order to suggest a solution. Takes note of the Tentative Lists presented in Annexes 2 and 3 of this document. 3. Takes note of the Tentative Lists presented in Annexes 2 and 3 of such document. 3. Decides to include on the Agenda of its 29th session in 2005 an item concerning the improved use of Tentative Lists. Tentative Lists of all States Parties must comply with the Operational Guidelines. Out of 193 States Parties to the Convention, 183 have submitted a Tentative List.